There are sixteen Oregon State Parks along the Oregon Coast, from the Washington state line at the Columbia River to the border of northern California. 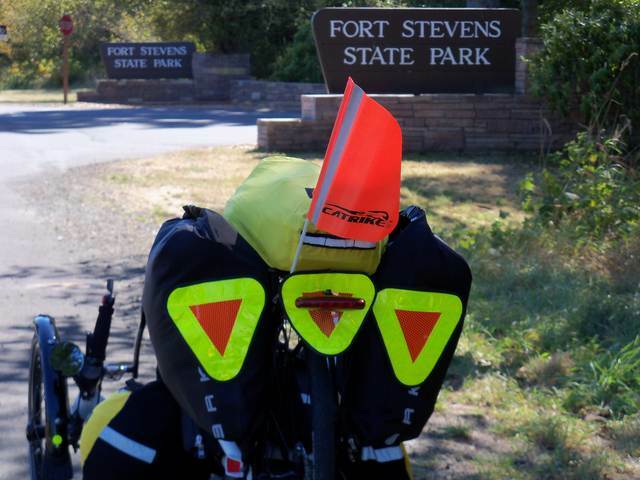 These state parks have Hiker/Biker camping facilities, including hot showers, for only $6.00 per night (2014 price increase – they used to be $5.00 nightly). Some have a laundry facility, such as Harris Beach State Park, just prior to the California state line. Most are right on Oregon Coast Highway 101, but some are on side roads, such as Fort Stevens State Park, Nehalem Bay State Park, Sunset Bay State Park, and Cape Blanco State Park. The park’s land was acquired between 1955 and 1974. Close to 790 acres were given to the state by Clatsop County between 1955 and 1960. Other lands were acquired by gifts, leases, and purchases from the county, local school district, U.S. Army Corps of Engineers, and a private landowner. The original earthen fort, completed in 1865 to protect the mouth of the Columbia River from Confederate gun boats and the British Navy during the Civil War, was named for Union Army Major General Isaac I. Stevens, first territorial governor of Washington, who died in 1862 at the Battle of Chantilly. The post later served as Oregon’s only coastal defense fort during the Spanish-American War, World War I, and World War II. The fort has the distinction of being the only military fort in the United States to be fired upon by an enemy during time of war since the War of 1812, when it was attacked by a Japanese submarine on June 21, 1942. The original tract of park land was given to the state by Tillamook County in 1938. Over the years, Tillamook County gave other lands, while the balance was acquired between 1939 and 1963 by purchase and litigation. From time to time, chunks of beeswax for candle making and other artifacts of a once-flourishing trade conducted by navigators between the Northwest Coast of America and Asia have surfaced at Nehalem Bay. In 1955, a large piece of beeswax approximately 15 x 16 inches in size and inscribed with numbers was uncovered in the course of park construction work. The original acquisition for Cape Lookout was a 1935 gift of 975 acres on the cape from the U. S. Lighthouse Service. Additional land was purchase from various owners of the beach area north of the cape and the entire Netarts Sand Spit, once owned by Louis W. Hill of St. Paul, Minnesota. The Hill property was partially a gift and partially an exchange involving lands on the spit for lands at Cascadia State Park. Lands were acquired up to 1988, including a tract of 40 acres on the south side of the cape. Originally, the park was left undeveloped as a natural preserve. Sam Boardman, the first State Parks superintendent, wanted to limit development to minimal picnic use at Jackson Creek with a trail to the cape. This picnic area was developed by the Civilian Conservation Crews (CCC) during the late 1930s. A study of the park development potential was made in the early 1950s and work began in 1952. In 1954 Cape Lookout opened a small campground which grew quickly to nearly the size of today’s campground by the end of the 1950s. In the early 1960s, Tillamook County built a road from the south end of Netarts Bay over Cape Lookout to Sand Lake to provide road access to the trailhead on the cape, and to the park from the south. During World War II, an Army Air Force B-17 bomber struck the cape while on coastal patrol on August 1st, 1943. It took a full day for rescue crews to reach the sole survivor. A plaque in memory of the air crew is located on the cape trail. The park was acquired between 1957 and 1961 by a gift from the city of Delake and purchase from private land owners. The name Devil’s Lake is thought to stem from an Indian legend concerning a serpent or spirit which inhabited the lake. Land along Spencer Creek was first acquired by the Highway Commission in 1942 – 1943 and subsequently transferred to State Parks. Additional properties were acquired from various owners by purchases, up to 1969. 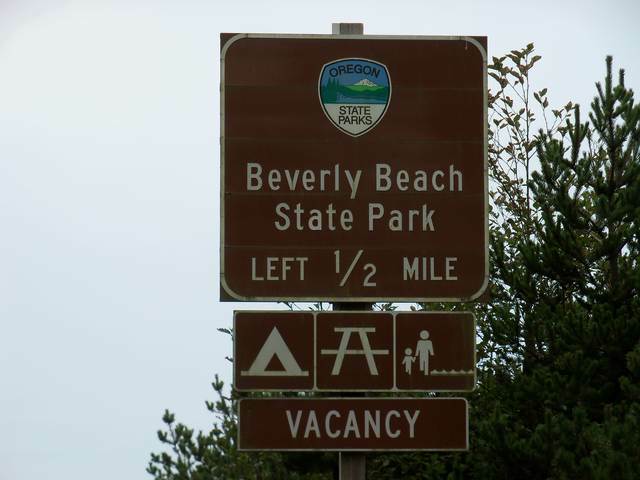 The park combines two areas once separately maintained, South Beach Wayside and South Newport State Park. The land was acquired by gift, exchange and purchase between 1933 and 1970. Gifts were received from Edith M. Bowman, Robert and Cherie Kiewel, Lincoln County and W. J. and Janet Wineberg. Bay. The lands were obtained to protect the south bridge area from encroachment and also to provide public access to the beach. The land was purchased from various owners in 1944 to provide public access to a large ocean beach at Big Creek, and to preserve native shore pine and vegetation. The park was originally named Big Creek State Park but this was changed by the Highway Commission upon public request in 1957, ending confusion with other similarly named public areas. The original tract was acquired by gift from the Narcissa Washburne Estate in 1962. The park was named in honor of Carl G. Washburne, husband of Narcissa, Eugene businessman and Oregon Highway commissioner 1932 to 1935. Negotiations for the park were started by Samuel Boardman in 1936. Purchased from private owners between 1930 and 1936, the area was named to honor Jessie M. Honeyman of Portland (1852-1948), a leading advocate of roadside beautification, Oregon parks and scenic preservation. She was a tireless supporter and guide to Samuel Boardman, the first Oregon State Parks Superintendent. Civilian Conservation Corps forces under National Park Service direction, designed and constructed improvements superbly adapted to their surroundings between 1935 to 1940. Among the features included in a special district listed in the National Register of Historic Places are the stone and log Cleawox Lake bathhouse (1938); the park caretaker’s house and garage (1936-37), now the park office; and several rustic kitchen shelters (1937). Other day-use facilities and landscaped roadways with stone curbings were constructed by CCC, and the sloped cuts on the Coast Highway were planted with shrubs. Overnight camping facilities were added on the south side of Cleawox Lake beginning in 1952. In the late 1950s, Honeyman Park was listed in Life Magazine as one of the outstanding state parks in the United States. Lands for this park were acquired between 1930 and 1951. Much of the original park was given to the state by Douglas County. Additional lands were purchased from the U. S. Government and private owners. In 1951, Menasha Wooden Ware Company donated just over one hundred acres. In 1968, a small surplus was returned to Douglas County. With the creation of the Oregon Dunes National Recreation Area (ODNRA) on the surrounding Siuslaw National Forest in 1972, an exchange of land was made with the U. S. Forest Service. The state of Oregon deeded 2,265 acres to the ODNRA in exchange for 1,006.48 acres of potential park land in Deschutes, Klamath and Lane counties. This exchange was completed in 1981. In its original conception, Umpqua Lighthouse Park was acquired to preserve the forested basin of Lake Marie plus a large ocean frontage with adjoining sand dunes. 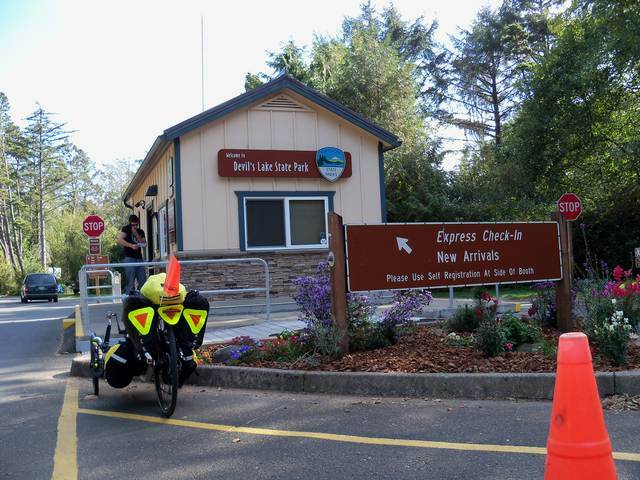 The park extended to the Oregon Coast Highway and bordered Clear Lake, the Reedsport water source, on its westerly side. Trees in the park included large Sitka spruce, western hemlock and shore pine as well as large specimens of rhododendron. The present Umpqua River Lighthouse was built in 1894 to signal the entrance to the Umpqua River. It replaced an earlier aid to navigation and remains a feature of the adjoining U. S. Coast Guard lighthouse base. Development of facilities in the state park began with trails and a picnic area at Lake Marie constructed by the Civilian Conservation Corps in the 1930s. In the late 1950s, an overnight camping area was added. The park was acquired between 1962 and 1976 through gifts from the Oregon State Game Commission and purchase from private owners. The park protects the public access to and use of Eel Lake, which over many years had become partly filled with logging debris. The lake was cleaned out by the Game Commission prior to its transfer for park purposes. The area has been developed for camping and day use, including boating and swimming and fishing. The name commemorates William M. Tugman (1894-1961), prominent newspaperman of Eugene and Reedsport. Tugman headed Governor Paul Patterson’s State Park Advisory Committee, which made the important citizens’ report and recommendations on State Parks in 1956. He became the first chairman of the State Parks and Recreation Advisory Committee, which was formed in 1957. The park was acquired between 1962 and 1985 by purchase from various owners, including the U. S. Bureau of Land Management. The Coquille River Lighthouse, built by the U. S. Coast Guard in 1896 and operated until 1939, sits at the confluence of the river and ocean. The Bullard family were early settlers in the Bandon area. Robert Bullard established a store and post office at the mouth of the Coquille River and operated a ferry, which crossed the river near the present bridge on U.S. 101. Cape Blanco was named in 1603 by the Spanish explorer Martin D’Aguilar because of the chalky appearance of the headland. The park land was purchased from the Joseph N. Hughes Estate in 1971. At the westernmost tip of the cape is a U. S. Coast Guard lighthouse reservation including an 1870 lighthouse. The headland is 245 feet above the sea and the light is visible for 22 miles at sea. Because of many past shipwrecks at this point, a powerful radio beacon for navigators was placed at Cape Blanco. The park land historically was settled by Patrick Hughes, a native of Ireland, who came to the place in 1860 and developed an extensive dairy farm, which spread into bottom land along the Sixes River on the north side of the cape. The spacious house that Hughes built for his large family overlooking the Sixes estuary in 1898 is all that remains of the ranch complex. The original land purchase from Carl White in 1926 was 30.6 acres near the mouth of Brush Creek. Sixteen other tracts were purchased between 1930 and 1975. Initial development of Humbug Mountain commenced in 1934 using Civilian Conservation Corps forces. In 1952, overnight camping was developed to offer visitors opportunity for an extended stay. Once known as Sugarloaf Mountain, the name was changed to “Tichenor’s Humbug” after an exploring party sent forth from Port Orford by townsite developer Captain William Tichenor in 1851 mistakenly went south instead of north, toward the mountain. Eventually, the name was shortened to Humbug Mountain. In 1958, a major forest fire burned much of the north side of the park. The balance of mountain timber was saved by a change of wind as onlookers watched, helpless but thankful. The land was purchased from various owners between 1926 and 1985. Early developments were made by the Civilian Conservation Corps in 1934 and 1935. Harris Beach is named for George Scott Harris, a native of Scotland, who obtained the property about 1871. Harris served in the British Army in India, later going to Africa and New Zealand. He arrived in San Francisco in 1860, worked in railway construction and mining and migrated to Curry County in 1871 where he became a naturalized citizen on April 6, 1880. Mr. Harris raised sheep and cattle on the park land, which passed to his nephew, James, in 1925, and also served as Curry County Commissioner in 1886-87.